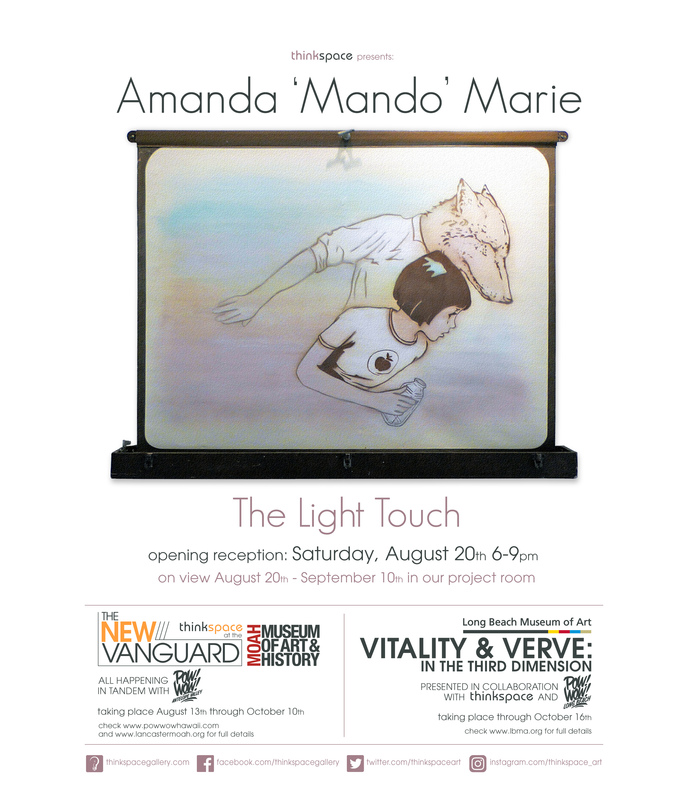 On view in the Thinkspace project room is The Light Touch, featuring new works by Amanda ” Mando” Marie. A stencil artist based out of Colorado, Marie creates large-scale site-specific murals and works on paper and canvas. 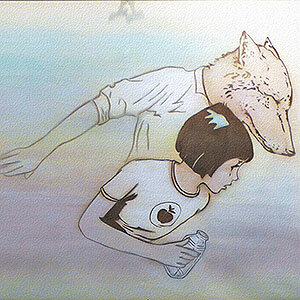 Her images invoke a time of innocence through hyper-stylized and intentionally dated depictions of children and animals. With nostalgic storybook-like imagery that is at once playful and ominous, Marie subtly pairs lighter subject matter with elements of the uncanny. With graphic concision and compositional simplicity, particularly in her use of clean cut-out silhouettes, muted palettes, and graphic patterning, Marie uses seemingly innocuous images to convey more complex, and at times darker and more sinister, adult themes. Marie’s works reference old-fashioned graphics and sewing patterns, as well as vintage 1940s “Little Golden Book” era illustrations. A recurring visual theme is “twinning” imagery, or a repetition of motifs to create unsettling doubles. Combining a variety of techniques and mediums, Marie is known for her use of screen printing, wheat pasting, drawing, hand cut stenciling, spray paint and brush applied acrylic paint. At first glance, her works feel light and whimsical, but with cleverly staged tension they unfurl an unsettling, albeit nonetheless charming and seductive, world of oppositions and disquiet. The Light Touch will showcase all of Mando’s various techniques and we couldn’t be more thrilled to be working with her. Marie will also be contributing a mural piece to this year’s POW! WOW! Antelope Valley, and is featured in the Lancaster Museum of Art and History’s show The New Vanguard, on view from August 13 to October 30.